Benching systems, also known as benching desks, are becoming an increasingly popular choice for workspaces versus use of cubicles. By having numerous employees share one long work surface, they are better able to collaborate. Plus, this type of office furniture solution has a low profile, and is easy to add onto should your workforce continue to grow. If you are looking for benching systems for your workspace in the Alpharetta area, then turn to NorthPoint Office Furniture. We have been in business since 1994, so we have the knowledge of the office furniture industry needed to help you outfit your company with just the right pieces. We can even assist with space planning for commercial businesses, so that you can maximize your office space. 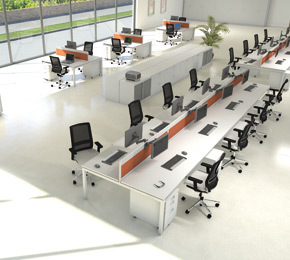 For more information on the benching systems we currently have available for your business in the Alpharetta area, contact NorthPoint Office Furniture today. Better yet, stop by our 8,000 square-foot showroom to see displays of our furniture in person and test it out for yourself.